Himachal Pradesh has been known for the tourism and Mountains covered with snow. 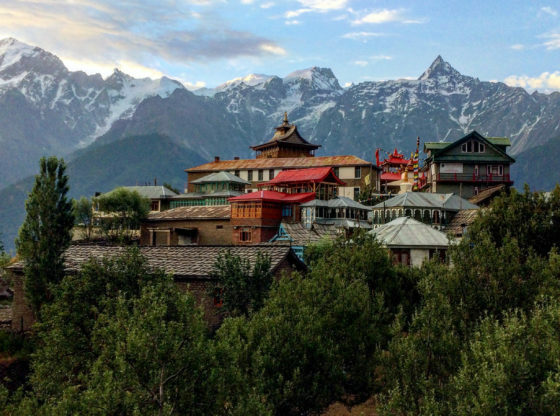 Since Instagram was launched almost 7.5 years from now, tourists have started exploring the locations more and more, The Last Village of India, Highest Post Office of India, or Last Motorable village of India, These names got popularity just because people reached there. Its also the case that, people have started investing in their life too. People need a break from the hectic life and therefore they choose a location which is far away from the hustle of cities. All thanks to social media that these places are now in limelight and of course it creates financial opportunities for the locals as they offer you Home Stay, Food etc. I will not mention the places where you can get Hotel, Cab easily. You can search them on google easily. Chitkul (Chittkul) is a village in Kinnaur district of Himachal Pradesh. It is the last inhabited village near the Indo-China border. The Indian road ends here. During winters, the place mostly remains covered with the snow and the inhabitants move to lower regions of Himachal. Potatoes grown at Chittkul are one of the best in the world and are very costly. (Source Wikipedia). A breathtaking village 20 km north of Keylong and 7 km south of Darcha along the most explored Leh-Manali Highway and on the banks of Bhaga River, Jispa is the place where you can choose to halt. You can choose to stay in tents or you can local stay. The village is occupied with a helipad, post office, and a monastery. Chandratal or Moon Lake is situated 6 KM far from Kunzum Pass in Lahaul and Spiti, If you ever plan a trip to Spiti, You must visit this place. Long ago, a song was ” Parvat k piche, Chambe da gaun”. But due to difficulty in reaching, this place became less popular among people. Khajjiar is known as Mini Switzerland of India. You can see mesmerizing beauty of Kajjiar and Chamera River. This place is very beautiful. If you are looking for an adventurous route for trekking, then this trek is for you. After this tiresome yet adventurous journey, one can experience the relaxing natural hot water springs here. Nagger Castle is for those who want to visit some different place, filled with art and painting. The Castle is located at the Naggar town in Manali which is quite famous for the various tourist attractions in and around the place. The southern region of outer Himalayan Peaks, rising to the north of Kangra and Mandi, Dhauladhar. Those who have perfect trekking skills can choose to visit this trek because of its of its differing topography and vertically inclined peak. Situated 74.7 KM away from Mandi, this lake offers you unique sight during winters and this is the only reason you have to make a visit to Parashar Lake this winter. You can also choose to visit this in summers but the best is in Winters when its covered with snow. Located just 122 KM away from Manali, this pass connects the Kullu Valley and the Lahaul Valley to the Spiti Valley. The Chandratal Lake lake cuts through this pass. This router is challenging but worthy. I kept this place separate from point 5 because this place has its own Identity. Every tourist who visits Spiti Must visit this Monastery. Himalayan trekking in Tosh Valley will take you through gorgeous meadows and streams leaving you breathless. Begin from Barsheni and hike up to make pit stops at Buddhaban and the Tosh Village. There are many more, Comment down for suggestions. I will bring new post with your suggestions. Say No To Plastic, Polythene. Keep Himachal Clean. Whenever you plan a trip to Manali, keep in mind these activities.